NASA’s Stainless Steel Chain Mail from the future! Stainless Steel continues to Rock! Why is stainless steel stainless? Also known as ‘insert’ and ‘drop-in’ bowls, inset sink bowls are designed for easy installation from above, into a cut-out in an existing or new worktop made from any material. 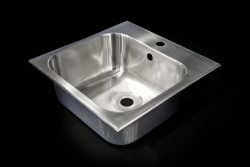 We offer a range of standard (prefabricated), stainless steel inset sink bowls, which can be supplied either on their own or as an integral unit, pre-inset into one of our superb-quality, bespoke stainless steel worktops. The main benefit of this set-up is that the bowl and worktop are welded together – leaving no visible joins, in which dust and bacteria can gather. This maximises the antibacterial efficacy of the stainless steel, making it particularly suitable for a catering, healthcare, veterinary, washroom or laboratory environment, where hygiene is of the utmost importance. Where the stainless-steel drop-in bowl is to be installed in a worktop made from a different material, such as Trespa or stone, we supply it with integral worktop-fixing clips, to ensure a watertight finish*. Our range of prefabricated stainless-steel insert sink bowls can be supplied in a choice of 304, food-grade, or 316, laboratory-grade steel. Please consult our chart for full product specifications. 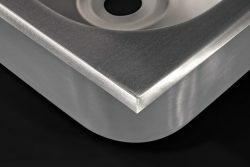 For environments where a more precise specification is required, take advantage of our bespoke service, whereby our skilled engineers will fabricate a stainless-steel inset bowl to your exact specifications. These premium bowls are even more robust than our prefabricated range and will last for decades. Again, there is a choice of either food- or laboratory-grade metal. Both are exceedingly heat-resistant; however, the laboratory-grade steel also offers high corrosion resistance – ideal in an environment where corrosive chemicals are deployed. Take a look at the sector categories below, to find the right product for your needs. *With the application of appropriate sealant during installation. Our products can all be custom made precisely to your the design, size and spec. Please feel free to get in touch to discuss your requirements. Our range of prefabricated 316, laboratory-grade, stainless-steel inset sink bowls are made from high-quality, pressed metal, which has unique antibacterial properties, making it the ideal choice for laboratory use. Durable and impact resistant – and more heat-tolerant than epoxy resin, which has been known to crack under extremes of heat – these quality products are an easy-to-install option for your laboratory. Fitted with integral brackets for straightforward fitting, they can simply be inserted from above into a cut-out in any worktop, then fixed in place using the integral clips. For the ultimate in hygiene control for your laboratory environment, choose one of our stainless-steel worktops, into which we will weld your stainless-steel drop-in sink bowl, for a seamless finish, leaving no visible joins, in which bacteria and dust can gather. This is also the simplest option, as we will supply the worktop and bowl as one fully-integrated unit – saving you the time and effort of ordering a bench top separately. Please refer to the chart, for the options available in our range of prefabricated stainless-steel insert sink bowls. For cases where a laboratory’s activities result in unique requirements, we offer a bespoke service, to exactly match your needs. 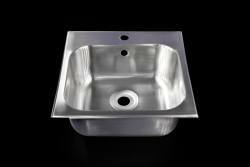 Our skilled engineers can fabricate a sink bowl to any length and width, in a depth of up to 450mm. All of our bespoke bowls are supplied with a 30mm kinked inset flange as standard – although this size can be varied if required. Waste and overflow holes can be fitted almost anywhere; for large bowls, we recommend a rear sitting (to the left or right), to ensure efficient drainage. acid-resistant un-slotted polypropylene waste and overflow tube. With superior antibacterial properties and an easy-clean surface, our stainless-steel inset sink bowls are ideal for use in clinics, care homes, hospitals, dental practices and GPs’ surgeries, where hygiene is paramount. Designed for ease of installation, our prefabricated bowls come with integral fittings, to ensure a watertight fixing within a worktop of any material*. Long-lasting and resistant to both impact and extremes of heat, they are ideally suited to any healthcare environment. Our prefabricated bowls are made from high-quality, pressed steel and come complete with all fittings, including the waste unit. Please refer to our specifications chart to see all of the options available in our prefabricated bowls range. Alternatively, for areas where a specific size or shape of bowl is required, contact us to discuss the possibilities. We offer a bespoke service, to fabricate the exact product you require. Our made-to-measure, stainless-steel drop-in bowls are of premium quality and are so hard-wearing, they will last for decades. We can fabricate a stainless-steel insert bowl to any width and length, with a depth of up to 450mm, to meet your requirements exactly. We can also weld bowls into our bespoke stainless-steel work surfaces. This avoids joins in which bacteria can gather. No other material offers this seamless finish, which is the most hygienic option for a healthcare environment. Take a look at the almost-limitless options available in our worktop range. We also offer a wide variety of other stainless-steel products, from cupboards and shelves to splashbacks, shower trays, trolleys and tables. A stainless-steel inset bowl is a neat way to incorporate a wash-bowl into any environment. Whether you need a bowl for a food technology room, a laboratory, a childcare facility or a catering kitchen, our prefabricated units take up minimum space and are virtually maintenance-free. They are also simple to install: integral fixing-clips allow easy installation from above, into a cut-out within any work surface. With no drainer (please see our separate, Sinks, section if you require a drainer), these bowls fit neatly into place, giving a streamlined, integrated appearance to the area. All of these standard bowls are supplied with a kinked inset flange. For full specifications of all our prefabricated bowls, please consult the chart. If none of these standard bowls is right for your project, we also offer a made-to-measure service. With an unlimited choice of width and length of bowl, and with the option of varying the depth up to a maximum of 450mm, we can fabricate the exact unit you need. Made from premium, 304, food-grade steel (316, laboratory-grade is also available), our bespoke units are not only impact- and heat-resistant, but are also so robust and durable that they will last for years – far longer than other materials, such as ceramic, which tends to chip and discolour over time. This makes them the most cost-effective option in the longer term. We offer a wide range of other stainless-steel products, perfect to furnish your educational space. We can inset your sink bowl into the top of a stainless-steel cupboard or worktop, to give an easy-clean, seamless finish in a food technology room or catering kitchen; we can add shelves for storage; a plinth to block off access to plumbing pipes – perfect in a nursery environment; or a splashback, to protect the wall behind the bowl. The space-saving choice for easy integration into your kitchen’s work surfaces, our prefabricated stainless-steel inset bowls (also called ‘drop-in’ or ‘insert’ bowls) are available in a wide choice of sizes and shapes. Made from quality, 304 food-grade steel, they meet all current Food Hygiene and Health & Safety regulations. Because stainless steel is simple to keep clean and naturally antibacterial, the kitchen’s stringent hygiene requirements will be easily upheld on a long-term basis. Our prefabricated drop-in bowls are available in a range of sizes – please refer to the chart for full specifications. If none of these standard bowls is right for your project, please get in touch: we offer a bespoke service, by which our engineers will fabricate the exact size of sink bowl you require, to fit your individual room plan. These made-to-measure bowls are made from a premium, food-grade steel, which is so heat-resistant and robust, it will last for decades in even the busiest of commercial kitchens. Our bowls can be ‘dropped’ into a cut-out in any worktop and fixed in place with the integral clips. We can also weld them into a stainless-steel worktop. The benefit of this combination is that there are no seams between the bowl and work surface, in which germs can otherwise gather. Other options include adding a bowl to the top of a stainless-steel cupboard – offering storage and hygiene in one unit. We can also supply splashbacks, shower trays, shelves, sinks and preparation tables. Our unique workshop set-up allows us to be flexible in what we can provide. Get in touch today, to discuss the requirements for your catering environment. Easy to drop into a cut-out in a worktop of any material, and with an easy-clean, antibacterial surface, our stainless-steel inset bowls are the best choice for a washroom, offering maximum hygiene over the long term, with a minimum of effort. The high-shine finish is an aesthetically-pleasing option for a gleaming washroom setting, whilst the sheer toughness of the steel means it is also the practical choice. Our insert bowls are available in a range of prefabricated sizes – please refer to the chart. We can also fabricate bowls to fit individual room requirements or specific designs. This higher-specification option features our premium food-grade steel, which will last for decades. Whether you require a drop-in bowl in a specific size or an unusual shape, our engineers can fabricate a bespoke product to your exact specifications. Whilst our inset bowls are designed for straightforward fixing to any material of countertop, they are especially practical when inset into a stainless-steel worktop. The welded finish is seamless and provides a fully-integrated, ultra-hygienic surface: check out our range of worktops, all of which can be customised to your requirements. To finish off your washroom, we can also provide plinths, to deter vandalism in a public or school lavatory, plus splashbacks to protect walls. Shower trays are another popular product for washrooms – again, these are super-robust and therefore very durable. Our stainless-steel inset sink bowls (also known as ‘insert bowls’ or ‘drop-in bowls’) slot neatly into your work surface, giving your kitchen or bathroom an integrated, streamlined finish. Perfect for fitting into any material of worktop from sleek stone to glossy laminate, the bowl’s lack of drainer makes it a space-saving, contemporary choice to complement your home. (Please see our ‘Sinks’ section for bowl-and-drainer units.) We supply our prefabricated bowls with integral clips, making them straightforward to fix to your countertop. For a really stylish finish, consider integrating your bowl into one of our bespoke stainless-steel countertops. We will weld the bowl to the work surface, to give a seamless finish matched by no other worktop material. Your bowl-and-worktop combination will present a high-shine, low-maintenance product that will last for years, retaining your kitchen or bathroom’s cutting-edge, luxury appearance. We stock a wide choice of prefabricated, pressed-steel inset bowls. Please refer to the information chart for full measurements and specifications. If you are looking for a bowl size or shape that is not shown here, please get in touch – as well as our made-to-order worktops, we offer a fully bespoke service, to create any item our clients require. Our made-to-measure insert sink bowls are fabricated from premium stainless steel, which is supremely robust and impact-resistant, and will last for decades, making them a cost-effective choice that belies their high-end appearance. Take a look at our full range of products to find more high-tech items for your contemporary home, from stainless-steel cupboards and shelves to splashbacks, shower trays and plinths. Our skilled engineers love a challenge – let us know if there’s anything you need, that’s not on our website. A busy veterinary practice needs space-saving, ultra-hygienic wash areas. 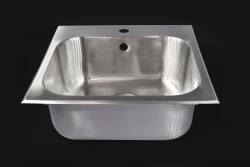 Our prefabricated inset sink bowls feature pressed, food-grade stainless steel, which is naturally antibacterial and is easy to clean and maintain, making these bowls the perfect choice for your clinic. The neat, drainer-free unit (please see our ‘Sinks’ section if a drainer is required) will provide a streamlined finish to your work surface, whilst taking up minimum space – leaving room on your work surface for the plethora of items needed in your daily practice. Take a look at the chart, for full specifications of our stock of prefabricated bowls. If you require a specific size of insert sink bowl not shown here, consider one of our bespoke bowls, which we can fabricate to any length and width, and to any depth up to 450mm. These made-to-order units are fabricated from our premium, food-grade steel (laboratory-grade steel is also available), and will last for decades, making them a truly cost-effective choice. Although designed to slot neatly into a cut-out in a worktop of any material, our prefabricated and bespoke bowls can be welded into one of our high-quality stainless-steel work surfaces. The seamless finish means there is no join in which bacteria and dirt can gather – making it the ultimate solution for hygiene control, vital for maintaining and protecting patient health. We offer a number of other products which can make your life easier, from plinths beneath wash units to prevent small-animal ingress, to shower trays and splashbacks. We also fabricate bespoke storage units, including cupboards and shelving. We can also make miniature steel staircases, to allow your patients to climb up to the examination table. Get in touch today, to discuss the specific needs of your veterinary practice. All of our products are almost 100% recyclable at the end of their life, and they are manufactured from over 50% recycled material.